This page is dedicated to Soroptimist federation officers who have recently passed away. They will be missed for their dedication to Soroptimist and our mission of improving the lives of women and girls. We are sad to report that Marjorie Conley, 1984-1988 SIA treasurer, passed away on July 4. 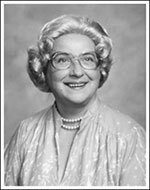 Marjorie, who joined Soroptimist in 1959, also served as Founder Region treasurer and governor and SIA foundation director and secretary/treasurer. Before World War II, she joined the Civil Air Patrol. As a 1st Lieutenant, she was a pilot, sometimes towed targets for the U.S. Navy and parachuted as part of her service. She also started a successful construction company with her husband and ran the company’s operations for over 50 years. Click here for more information.